Our office is located at 67 Macarthur Street Sale which is conveniently located close to the Central Business District of Sale. 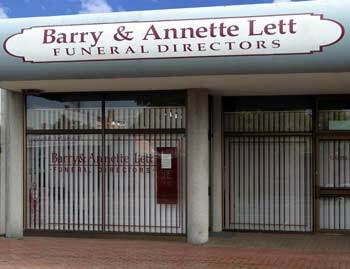 The office includes two arranging areas, a viewing room and a coffin selection room. When you entrust your loved one to our care we can offer a wide range of professional services including liaising with clergy or celebrant, making bookings with cemetery or crematorium, placing newspaper notices, and much more. We prepare and print quality service booklets as well as photo presentations. If you have any further enquiries you can call to make an appointment to see one of our staff either at our office, or in your home. You can find our Office on Google Maps. You can also find Delbridge Funeral Chapel on Google Maps. 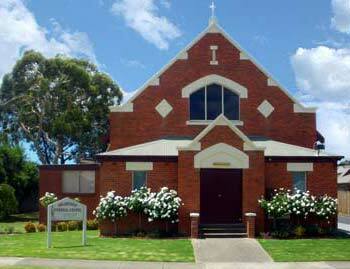 Located at 64 Marley Street, in Sale, the historic building was constructed in 1907 and was later named Delbridge Hall in memory of the late Bishop Graham Delbridge. 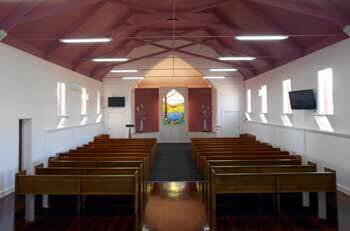 Barry and Annette purchased the Chapel from the Anglican Parish in 2006.
services led by clergy or celebrant.